Two games left in the AFL home and away season . Those teams are still jostling for places in the Finals , need to finish in the top 8 . St Kilda , coming off losing their last two matches , play a rejuvenated North Melbourne side , who are on a winning spree . The Saints hold sixth spot by percentage only ahead of Sydney . Fremantle and the Western Bulldogs are out of the Finals series . Sydney hoping for a home Final , play Geelong , at Skilled Stadium , and the Eagles take on an improving Lions side at the Gabba . Essendon play Port at Etihad on Sunday , and Richmond travel to SA to battle the resurgent Crows. .Melbourne and the Suns play at the MCG , in a sunday afternoon match . The same ground sees the Hawks and Bulldogs battle at the traditional Saturday afternoon time slot . 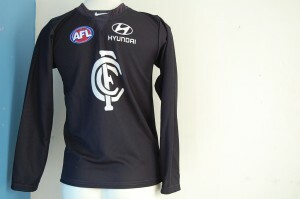 and fans wearing their football jumpers , jerseys , guernseys will be along for the ride . 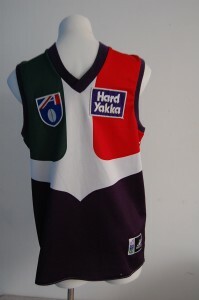 This entry was posted on Saturday, August 27th, 2011 at 9:04 am	and is filed under AFL, football jumpers, NRL. You can follow any responses to this entry through the RSS 2.0 feed. Both comments and pings are currently closed.